A lot of the concerts held in the church may be booked online from here. Payment can made via PayPal, which also allows a safe and secure method of using most credit and payment cards. PayPal accounts are free, but you do not need to open one in order to make payment. Unless otherwise stated, tickets will normally be kept on the door; please bring a copy of your receipt. For other concerts please contact the performers concerned. Please signup to our mailing list to receive occasional mailings about the concerts that have been arranged directly by the church. 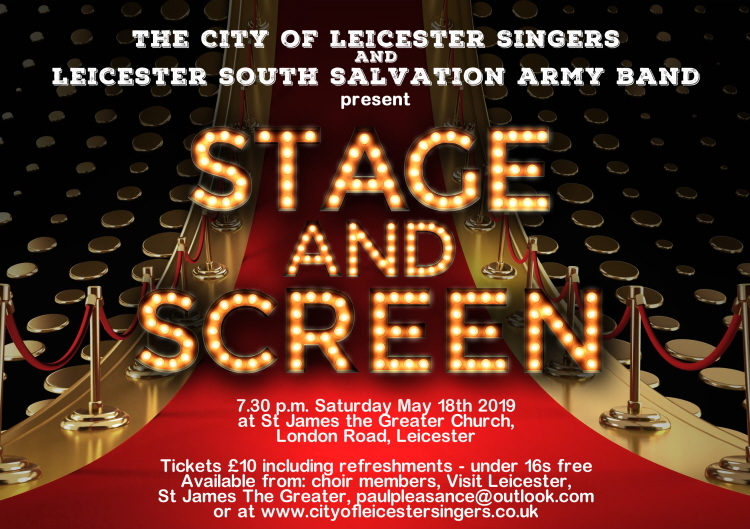 The City of Leicester Singers has decided to join forces with the Leicester South Salvation Army Band for their May 2019 concert following a very successful joint venture for last November's Remembrance Sunday. The concert will be in two halves, each part comprising a joint presentation of the choir and band, namely "Do you hear the people sing?" from Les Miserables and "The Grand March" from Aida. Within each half both groups will perform independently. COLS will sing a medley from Oliver and West Side Story in the first half and, in the second half, COLS will sing a selection of Opera Choruses including: The Villagers Chorus, Anvil Chorus, the Chorus of the Hebrew Slaves and The Bell Chorus. The Leicester South Salvation Army Band will play from its wide ranging repertoire of contemporary and classical music, including selections from both Christian and secular musical shows. There will be an interval during which time refreshments will be served. The concert will be conducted by both Richard Archer (COLS) and Andrew Piper (LSSAB) and accompanied by John Pye as well as the Band! The Church of St James the Greater, Leicester will use the information you provide on this form to be in touch with you and to provide occasional updates and marketing. You can change your mind at any time by clicking the unsubscribe link in the footer of any email you receive from us, or by contacting us at boxoffice@stjamesthegreater.org.uk. We will treat your information with respect. You agree that we may process your information in accordance with these terms.